BREAKING: Just when you thought it couldn't, fracking in the U.S. is about to get worse -- and with government approval. The Department of Interior's Bureau of Land Management just released new rules for fracking on our public lands that would give gas companies the right to drill without much-needed protections for public health. The BLM's new rules fail to require full public disclosure of toxic chemicals, baseline water testing or setback requirements of wells from homes and schools. Fracking our public lands will affect millions of people who live, work and go to school near (or even above) the areas where leases will take place. It is unconscionable for the government to pass new regulations that are fundamentally inadequate to protect our health and safety. Fracking is a dirty and dangerous process. The proposed BLM rules fail to take obvious steps to provide even minimal protections. Tell the Deptartment of Interior's Secretary Sally Jewell that you support no new leasing on our public lands. President Obama pledged to do more to combat climate change for the sake of our children and our future in his 2013 State of the Union speech, but the new rules will allow gas companies to place wells dangerously close to children and use toxic chemicals without disclosing them to the public. The Department of Interior's data on potential federal oil and gas leases in six western states shows that more than 1,400 public schools lie within one mile of potential drilling activity. Help us send 45,000 messages to Secretary Jewell to show her that Americans don't want any new fracking on federal lands. 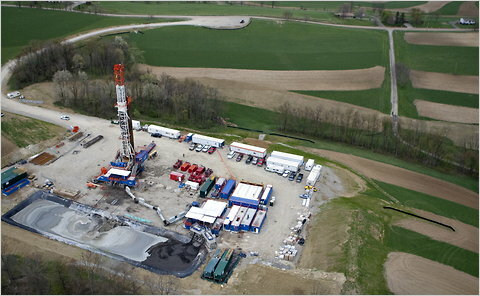 These rules are a gift to the gas companies, who met repeatedly with high-ranking officials before this rule was released.¹ The provisions help the gas corporations profit, while falling short in employing the most basic recommendations of the president's own shale gas advisory committee, which advocated for transparency, environmental safeguards and pollution monitoring for fracking. Without clear safeguards for public health, no new areas should be opened up to new drilling permits. We cannot give the treasure of our federal lands -- which belong to all of us -- to the gas companies and allow them to continue expanding fracking. Tell Secretary Jewell and the Department of the Interior to put a moratorium on all new gas leases on federal lands. Thanks for all you do for the environment. P.S. If President Obama truly wants to tackle climate change, then he needs to keep dirty fossil fuels in the ground as much as possible, and invest more heavily in true clean energy solutions such as wind, solar and energy efficiency. Natural gas is a dirty dangerous fossil fuel, not a climate solution! Tell the administration: no new leasing. We must not use our public lands to generate more toxic pollution when clean energy alternatives are ready here and now. P.P.S. After you take action, be sure to forward this alert to your friends and colleagues! E&E News. "White House huddled with industry before changes to BLM fracking rule," April 12, 2013.